This year finds the Royal Society celebrating its 350th anniversary. The Royal Society is Britain’s national academy of science, one of the first of such societies to be founded in Europe. My brief investigations suggest that only the Italian Accademia dei Linceis and the German Academy of Sciences are older, and then only by a relatively small margin. The goals of the Royal Society were to report on the experiments of its members and communicate with like-minded fellows across Europe. The Gentleman Administrator is planning some historical blogging on the Royal Society this year, starting with this post on the founding of the society and the role that Charles II played in it. On the face of it this post is about the history of the Royal Society, but in truth it says more about me as a data monkey than it does about the Royal Society. I shall explain. The Royal Society supply a list of previous members as a pair of PDF format files, these contain each fellow of the Royal Society with their election date, their membership type and, for some, the dates of their birth and death. The PDF is formatted in a standard way suggesting to me that it could be read by a computer and the data therein analysed. I suspect there is an easier way to do this: ask the Royal Society whether they can supply the data in a form more amenable to analysis such as a spreadsheet or a database. But where’s the fun in that? As an experimental physicist, getting data in various formats into computer programs for further analysis is what I do. This arises when I want to apply an analysis to data beyond that which the manufacturer of the appropriate instrument supplies in their own software, when I get data from custom-built equipment, when I trawl up data from other sources. I received a polite “cease and desist” message at work after I successfully worked out how to extract the text of internal reports from the reports database, they shouldn’t have said it couldn’t be done! I will save you the gory details of exactly how I’ve gone about extracting the data from the Royal Society lists, suffice to say I enjoyed it. In the earlier years of the Royal Society’s history the Presidential term varied quite considerably: Sir Isaac Newton served for 24 years (1703-1727), and Sir Joseph Banks for 42 years (1778-1820). Since 1870 the period of the office seems to have been fixed at 5 years. We can see that membership in the early years of the 19th century started to rise significantly but then after 1850 it started to fall again. 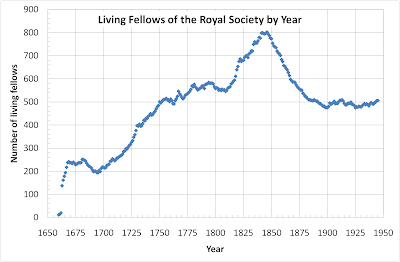 This fits in with historical records, in the earlier years of the 19th century some younger fellows pointed out that the Royal Society was starting to turn into a fancy dining club and that most of the fellows had published very little, in particular Charles Babbage published Reflections on the decline of Science in England, and on some of its causes. Wheels ground slowly but finally, in 1846, a committee was set up to consider the charter of Society and how to curb its ever growing membership. I’ve not found the date on which the committee reported but subsequent to this date, admission to the society was much more strictly controlled. Election to the Royal Society is still a mark of a scientist a little above the ordinary. The data on birth and death dates starts getting sparse after about 1950, presumably since many of the fellows are still alive and were reluctant to reveal their ages. Doing analysis like this starts to reveal the odd glitch in the data. For example,Christfried Kirch appears to have died two years before being elected. At the moment I’m not handling uncertainty in dates very well, and I learnt that the letters “fl” before a date range indicate that and individual “flourished” in that period, which is nice. If anyone is interested in further data in this area, then please let me know in the comments below. I intend adding further data to the set (i.e. hunting down birth and death dates) and if there is an analysis you think might be useful then I’m willing to give it a try. I’ve uploaded the basic data to Google Docs. The illustration at the top of this piece is from the frontspiece of William Sprat’s The History of the Royal Society of London, for the Improving of Natural Knowledge, published in 1722. 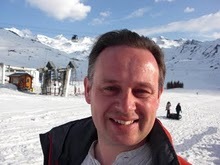 Thanks for the mention and again thanks for sharing your Royal Society list, I've already started making use of it. yes, more posts on the Royal Society (at some point!). I wonder if anyone has compiled a list of attendees at Royal Society meetings and experiments, that would be an interesting accompaniment to the members list. thanks for the link, I'd like to get into their archives at some point.